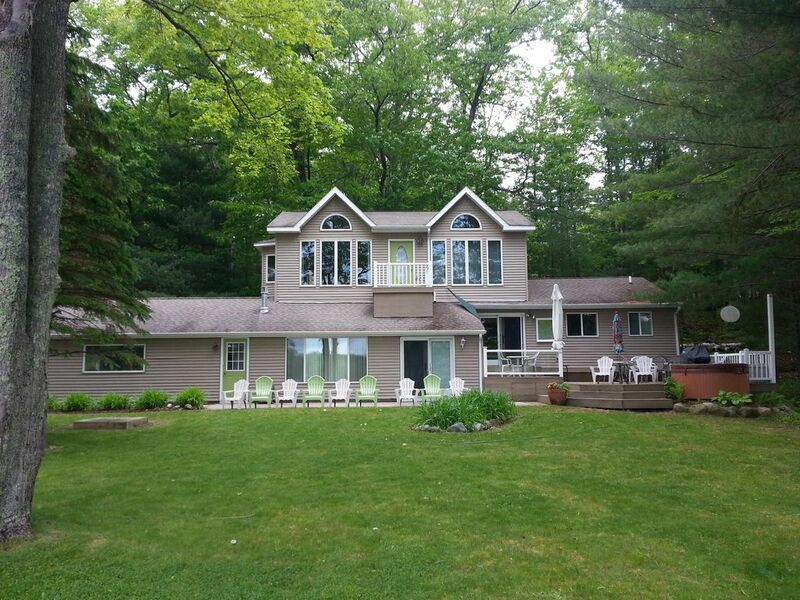 The expansive yard (100' x 100') lakeside area features a great deck with a HOT TUB. A comfortable hammock and tall mature shade trees for your 'reading' or 'napping' pleasure. Fishing is very good. The shoreline in front of the cottage is natural and full of wildlife. (soft bottom) We swim off the dock but the shore edge is natural (mucky). The Lake is very clean and offers sandbars for swimming and sunset pontoon cruises. The new Lake Ann beach park is sandy and accessible by boat or car. On the waterfront: a full dock with 16 square deck, row boat, Three 1 person kayaks, One 2 person kayak, and paddle boat are provided in the rental price. A 60 HP 24 foot pontoon boat can also be rented for an additional $800 per week. The large grassy lawn is great for playing baseball badminton, tag, frisbee toss or just walking barefoot in the grass. Surrounded by thousands of acres of State Forests and miles of hiking, cross country skiing and snowmobiling trails, the Lake House is the perfect place to base your Northwest Michigan vacation activities. Just minutes from the Sleeping Bear National Lakeshore and Interlochen Fine Arts Academy, the Benzie/Leelanau area is host to many forests, inland lakes and rivers, as well as Lake Michigan's gorgeous beaches. Championship Golf (27 Holes) is five minutes away (Mistwood). Traverse City, a short 15 minutes to the East, offers fabulous dining and shopping opportunities, plus the regional airport. Keywords: Lake House on Lake Ann, Waterfront, Nature, Hot Tub, Swing Set, Tree House, Sand-Box, clean water, swimming, Fishing, skiing, view, Family Vacation, KIds, A week to remember, golf, Sleeping Bear, Up North, boating, get a way, wine tasting. Lots of Pictures to share Just ask! This is our family. We love our Lake Ann Cottage and Esch Beach (where we took this picture) at Sleeping Bear National Lakeshore 20 minutes from our Cottage. We always have a picnic there and grill brats over an open fire, then watch the sun set over Lake Michigan. This is not a rental property, however we rent it 6 weeks a year to help with expenses. Come enjoy our family's Lake House. This Lake Ann Cottage is not a rental Property, rather it is a Special lived in, very comfortable Family Cottage that we choose to rent out a few weeks a year to help pay the taxes and Insurance! The Peace of Mind to know that the next several hours you have nothing to do! But enjoy nature and wildlife, take out a kayak, go fishing, golfing and maybe read a good book. . . decisions, decisions! A wonderfully large open grassy lawn shaded with large hardwoods ends at the water. Our Fire Pit, & Swing Set crowd the water's edge. A great environment for Kids of all ages. Close to an Eagle's nest 200 yards away. Tucked on the south arm of a clean, all use, 600 Acre, Lake Ann. We offer Eagle Nest viewing, Frog and Turtle hunting. Some of the best fishing in the entire lake is right off our dock. Situated in Manistee National Forest We look out at nothing but Nature. Deer and Coyote, wander across the bay. Loons, Great Blue Herons and all water fowl will need to be identified. Master bedroom suite only , remember this is UP North ! NOT Provided, Various Laundry Services Approximately 10 miles. Everything you need, as the Lake Ann Store says, "If we don't have it you don't need it!" Full size oven, Stainless large sink, Newer Fridge, Island work area with dishwasher. Front Yard, is the ultimate Playroom, You are in God's Country for Goodness sake! over 35 Jigsaw Puzzles to choose from from 24 pcs. to 1500 pcs. Large open grassy lawn with large deck overlooking it. 4 Kayaks(one 2 person), row boat, Paddle Boat, & Large wonderful Pontoon boat available for an extra charge. 27 great holes at Mistwood only a few minutes away. Six course within 20 minutes. It's rather large 600 acres, It's called Lake Ann. (THIS IS A JOKE) up to 70 foot deep. Linens provided, Ceiling fans in all bedrooms, Pontoon Boat for additional fee, Automatic full-standby electrical generator in case of power outage, large grassy lawn 100' x 100' leading to water's edge , a 16 x 16 foot deck at the end of the dock for swimming, sunning and cocktail hour, a firepit near water's edge, a kids swing set near near shore line for outstanding swinging experiences. This Lake Ann cottage is a beautiful place to spend quality time with family and friends. Lake Ann is beautiful, and while the area near the cottage has a muck bottom, the dock is perfect for swimming from, or for launching one of the many kayaks (or the paddle boat) that are for the use of renters. While we did not rent the pontoon boat, I believe it would probably provide the best views of the lake and the sunset. The owners are very kind and accessible, and the neighbors are wonderful and helpful! If you decide to spend a week or more on Lake Ann, I don't think you could go wrong by selecting this place. The location is perfect, so close to Interlochen, Traverse city, and Sleeping Bear Sand dunes. Our family had a great time. Don't forget to buy the fixings for Smores and use the fire pit! It made for a really fun dessert after dinner from the Stone Oven and live music at the Lake Ann Brewery! Our family returned to Lake Ann this summer and once again had a wonderful time! We love the huge yard with room for any activity, the large deck with seating for everyone , (we never used the kitchen table!) , the adjoining hot tub and the clean and spacious home. We rent the pontoon and spend many hours relaxing on it each day. We also rent a speed boat from a local company and the grandchildren tubed and skied all day! The house also has a wonderful bonfire area and plenty of wood which we use nightly. This year we used the kayaks provided frequently to go to Mud Lake. What a wonderful experience and the grandchildren ages 6-9 all loved it! We did go to Glen Arbor one day but once again did not want to leave the lake. If you are looking for a large comfortable house on a beautiful lake that includes so many extras and a very accommodating owner, look no further! Just don't book the week we want, because we will be back! Thanks Jeff and Maureen for another memorable week. Thank You for the kind words. It really is a special place ! Glad you discovered the amazing Mud Lake kayak trail! Spent a week at "Always" with friends and family. Home had everything we needed and was very accommodating for all four of the young children. Greatly enjoyed the pontoon, paddle boat, and kayaks! All of the fishershermen (experienced and novice) were successful in landing a few nice fish. Highly recommend taking the kayaks to Mud Lake and casting a worm into the lily pads. When not enjoying Lake Ann we ventured into Traverse City, Glen Arbor, Frankfort and Sleeping Bear dunes. The location was perfect! Thank you Jeff for making the process easy and inviting. The name of this cottage is Always and it is perfect in All Ways!! We stayed for a week with 12 people and 3 generations ranging from 3-70. The house is very spacious and welcoming. We appreciated that the owners even provided extra things like bug spray, firewood, basic kitchen supplies etc. However, it was the outside we loved even more.! Bonfires in the fire pit at night, plenty of room for yard games many of which the owner provided, hot tub on the deck where we ate every meal, fishing off the dock where the young ones caught their first fish, kayaking to mud lake, a great swing set facing the lake and having to almost "sign up " to get time in the hammock are just a few of our memories. We rented the pontoon (and also a speed boat from another supplier) so we spent our days tubing the lake and then anchoring the pontoon and swimming while others used the speed boat to ski. Even the 6 year olds "got up" on the skis! The lake is so private and calm that the 3 and 4 year olds were able to swim, with their life jackets of course, around the pontoon and play on the rafts. We went to the dunes one day and some golfed at Mistwood in the early evenings which was very nice. However, we really did not want to leave the lake. We would highly recommend this lake house. Thank you to the Jeff and Maureen for a wonderful week! We have stayed at this property several times during all four Michigan seasons. I would highly recommend this cottage to anyone with a singular family, an extended family, or to many adults looking for a great time. The house is in excellent condition and has always been very clean and provides everything needed to make it an easy, relaxed and enjoyable vacation. Not only does the house have a great layout to enjoy one another, the large yard provides an area for many fun activities. We have also taken pleasure in all the amenities that this place has to offer. Our favorites are waking up in the morning and enjoying the hot tub with the mist hanging over the lake, the wildlife, the kayaking into a small neighboring lake, hiking in the state forests, enjoying a great round of golf at Mistwood and of course enjoying a glass of wine on a nightly pontoon ride on Lake Ann. Our day trips usually end up with us touring the wineries of Leelanau and Old Mission Peninsulas. We will continue to recommend this property to our friends not only because of it’s proximity to Interlochen, Traverse City and Lake Michigan but also it’s charming characteristics. We have stayed at this cottage a few times over the last several years. It is wonderful for big families with great living spaces for everyone together or individually. My favorite thing is that it sits on a part of the lake that overlooks state forest. The birds and wildlife are incredible. I love waking up to the sound of the loons. The pontoon is a definite plus, and the lake is gentle and warm for small children. It is one of the warmest lakes that I have ever been in, in Northern MI. There were Kayaks and a fishing boat and a nice dock to sun on. It is also in great proximity to shopping and golf. Beautiful hiking across the street at Ransom Lake and nice for cycling as well. We always choose to use it for our big family reunions when it is available. Interlochen nationally known Live musical performances, Sleeping Bear Dunes National Lakeshore is a must as is its museum, and sunset on Lake Michigan (we love Esch Beach).Traverse City offers great entertainment at several venues. Lake Ann Brewery has an Outdoor Beer garden with Live music 5 nights a week and is Kid friendly. Over 30 Wineries offer tasting rooms just north of us. River Kayaking and Canoeing is fun just west of us on MI 31. The fish hatchery offers tours. Fishtown in Leeland(great Dining) is near as is, Shopper friendly Suttons Bay.